Originally published more than twenty years ago and winner of a Lambda Literary Award, Paris Was A Woman is a rare profile of the female literati in Paris at the turn of the century. Now with a new preface and illustrations, this “scrapbook” of their work—along with Andrea Weiss’ lively commentary—highlights the political, social, and artistic lives of the renowned lesbian and bisexual Modernists, including Colette, Djuana Barnes, Gertrude Stein, Alice B. Toklas, Sylvia Beach, and many more. Profusely illustrated and painstakingly researched, it is an enlightening account of women who between wars found their self and their own voice in Paris. 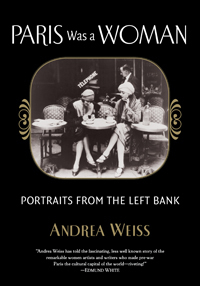 A wealth of photographs, paintings, drawings, and literary fragments combine with Weiss’ revealing text to give an unparalleled insight into this extraordinary network of women for who Paris was neither mistress nor muse, but a different kind of woman. ANDREA WEISS is an award-winning documentary filmmaker and nonfiction author. Her most recent book, In The Shadow Of The Magic Mountain: The Erika And Klaus Mann Story won the Publishing Triangle Award for nonfiction. She has been granted fellowships from the National Endowment for the Humanities, National Endowment for the Arts, New York State Council on the Arts, and New York Foundation for the Arts, as well as an Emmy Award for her documentary Before Stonewall. She lives in New York City and teaches at The City College of New York. For more information, visit www.andreaweiss.net.